As early as 1837 missionaries were sent out from the Mississippi Conference to the Republic of Texas. Methodism did not take from in Texas until 1840, when the Texas Conference was organized at Ruterville in Washington County. In 1844 the Texas Conference was divided into the Texas Conference and the East Texas Conference, the Trinity River being the dividing line. In 1866 the East Texas Conference was divided into the East Texas and Trinity Conferences. Then, in 1874 the name of the Trinity Conference was changed to the North Texas Conference. Thus, our beginning. In the meantime, settlers from the various states had been coming into Texas, many of them settling in what is now Frisco, and Collin County. Try to visualize the abundant grass lands, with here and there a settler's crude house and other buildings for the protection and maintenance of the family. The roads were mere winding trails from farm to farm. Also, can you imagine how impassable they must have become in a rainy season? Rev. Joab Biggs, a pioneer Methodist preacher, organized Bethel Church in July, 1848. He was born in North Carolina of Primitive Baptist parentage. He was converted and joined the Mississippi Conference. He moved to Arkansas and came to Texas with the Culwell family in 1846, settling in what later became Collin County. The first few years, the church services were held in a log cabin belonging to William Rogers. He gave 2 acres of land as a building site. The membership decided to erect a building 16 x 24 ft. Not having any funds, they went to Elm Creek and hewed out timbers for framing, and rived out boards for the roof and siding, using wooden pegs as nails. The floor was of dirt and split logs were used as benches. For several years there were no heating facilities. Then a 4 ft. fire place was built, using rocks for the chimney. The second church, from the best authority, was started in 1859. Again the timbers for framing were hewed from trees on Elm Creek. Cottonwood shingles were used. The siding was hauled from the pine mills in East Texas. Before this building was completed, in the spring of 1860, a storm blew it away. These sturdy pioneers knew no defeat and set in to erect a larger building, this one being 30 x 40 ft. Boxing planks were used as a floor. This building was not completed until after the Civil War. It was used until 1882. Pioneer citizens tell of the camp meetings held near Bethel Church prior to and after the Civil War. In 1874, Joseph B. Rogers, A. P. Rogers' grandfather, gave 10 acres of land adjoining the church property for camp meeting purposes. This was, also, used as a place for the annual revival meetings. An old fashioned brush arbor was used at first. It was build by the members. In 1888 a commodious shed, 40 x 60 ft., was constructed. It was used until 1901. These camp meetings marked the turning point in the spiritual life of many, many people. The influence was felt for miles around. These meetings would last 10 to 15 days. There would, at times, be as many as 40 or 50 families in the camp. Frequently there would be as many as a thousand people at the services. Sometimes as many as 25 conversions resulted from a single service. The day usually began with a sunrise prayer meeting, experience meeting a 9 o'clock, preaching at 11:00, preaching again at 3:00, grove meeting at sundown, then preaching again at early candlelight. Rev. Wm. Allen, in the early 1870's, assisted by the church membership, erected a building for school purposes. In 1882, it was turned to the church to be used for worship. It was used until 1902. Judge George P. Brown of McKinney attended the recent Homecoming and Eighty-Sixth anniversary of the organization of the Old Bethel Methodist church, now known as the Frisco church, on May 6. He was very much interested in the program of the day. He was born and reared near Plano, not many miles away, of pioneer Methodist parents. From his parents and grandparents, he learned much concerning the establishment of the early Methodist churches of this county. He submits the following comments on the organization of the first Methodist churches of the county, which have been made pertinent to his mind by the Eighty-Sixth Anniversary program of the Old Bethel-Frisco church. IN 1852 ON LAND DONATED BY WILLIAM ROGERS. THAT A LARGE SHED WAS BUILT AT THE SITE IN 1888. CHURCH. 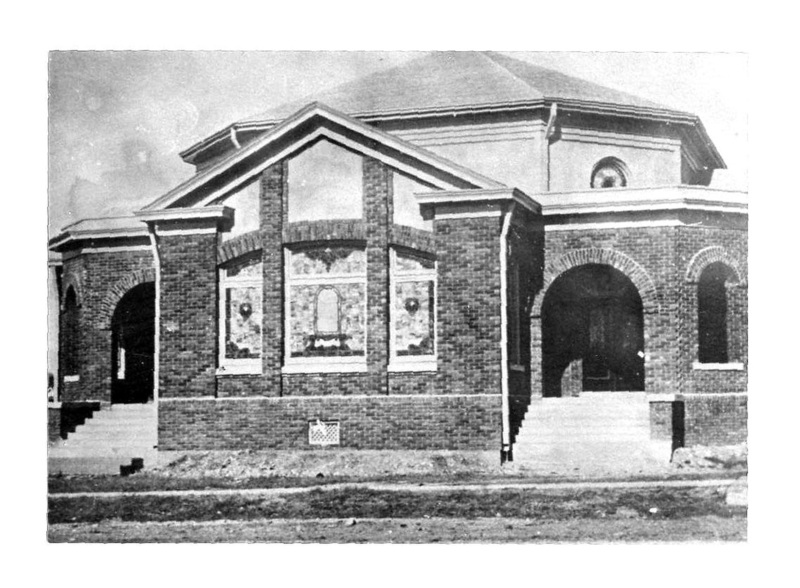 A NEW BRICK SANCTUARY WAS COMPLETED IN 1915. CONGREGATION HAS EXPANDED ITS EDUCATION PROGRAMS. GROUP ACTIVITIES AND OUTREACH PROGRAMS. The first written record of our Sunday School is found in the Quarterly Conference minutes of January 25, 1873. Beverly L. Rogers was then Superintendent. There was a Sunday School prior to this date, however, of which J. A. Rogers served as superintendent. In 1873 the Sunday School had five teachers and seventy-five pupils. The following men have served the Frisco Sunday School as superintendents at Old Bethel and later Frisco, after the church was moved to the latter place: J. A. Rogers, B. L. Rogers, A. J. Gunstream, O. L. Hamilton, Dr. R. L. Douglas, Ed Jackson, Byron Smith, H. L. McConnell, W. S. Bowers, B. A. Marcom, J. H. Houser, W. A. Brewer, S. F. Cooper, Murrell Rogers, James Brooks, James Marion, Cal Wester, Tracy King, W. L. Waldsmith, Isabel Sem, Kay Kelsey and David Brooks to present.